The Kalverstraat is the main shopping street in Amsterdam. 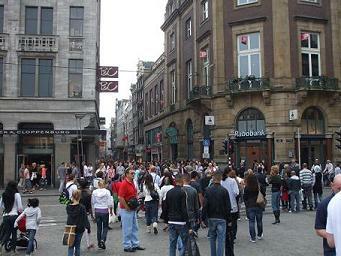 Location is between the Dam Square and Munt Square. Distance to Central Station is 1km – about 12 minutes walk. Tram lines 4,9,16,24 and 25 have a stop near Dam Square. (200m from Kalverstraat). Another main shopping street Nieuwendijk – is on the other side of Dam Square (150m).